For three nights only the creative team from Aziamendi restaurant brought their vivid cuisine, daring art works, wine and cocktail expertise to Phuket. The 'pop-up' event was held at Black Salmon in the Laguna area of Phuket from January 13 to 15. The first night was a celebration of the 'plates' menus currently served at Aziamendi's lounge with delicious cocktails curated from mixologist, Albert Garcia Mozley. 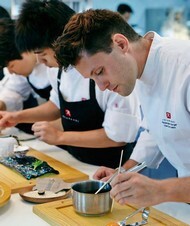 Signature degustation dinners were served on the remaining evenings with sell out success. Diners enjoyed their meal complemented by a wine-pairing menu from Fabien Etienne's winning 'Thailand's Wine List of The Year 2014'. Some of the dishes highlighted included 'The Garden', 'Fois Gras Ashes' and 'Pigeon with Duxelles & Cauliflower'. Aziamendi is part of the Iniala Beach House in Natai beach and is home to some of the most exquisite art pieces from artists around the world. The team were proud to display some art works from renowned artist Wasinburee Supanichvoraparch to guests at the event. Aziamendi's Chef de Cuisine, Alex Burger explains, "The objective of the 'pop up' at Black Salmon is to bring our fine dining and passion for art concept closer to Phuket people, but also to keep us all on our toes by challenging us all to adapt to different environments."